Disclosure: This is a sponsored post. I received a HoneyBaked Hams gift card in exchange for sharing this information. As always, this post contains my honest opinions. Information about products was provided to me by HoneyBaked Hams. Whether you are a die-hard fan of the Denver Broncos or the Seattle Sea Hawks all along or have chosen a team to follow since your team was knocked out, the Super Bowl is an exciting time of year! Friends gather to watch and cheer and party. I have chosen to cheer for the Broncos this year for two reasons. The first reason is that Peyton Manning used to play for the Tennessee Volunteers. 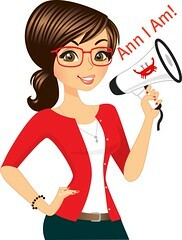 The love of my life is a Volunteer fan and my favorite place to live was the home of the Volunteers. So, I feel some connection to the Broncos. I also think Peyton Manning is a great guy and like to see him succeed. The second reason I have chosen the Broncos is they played and won in Super Bowl XXXIII. That was the day my husband asked me on our first date. ♥ I have no connection to the Sea Hawks that I can think of. So, for whatever reason you follow a team, there is nothing like a Super Bowl game day party with great food. According to Harris Interactive polls, the Super Bowl still ranks as the second biggest eating holiday of the year and tops the chart as the biggest "party at home" day--even bigger than New Year's. Research shows that people spend about $70 on snacks for the game day. I am all about great food and simple prep on my part when having company (that way, I can focus more on having fun). A place I had never really thought of using before for a game day party is HoneyBaked Hams. I have used them in the past for sit-down dinners, but never for casual dining. However, they have a great menu for entertaining. A great item they have that is perfect for a Super Bowl Game Day party is the Super Sandwich. This sandwich is on fresh baked rustic pan bread and filled with your chose of meat and cheeses. It comes with tomato, lettuce and even a bottle of honey mustard mayo (yum). It comes in two great sizes at great prices--the medium serves 6-10 people starting at $26.99 and the large serves 12-20 people starting at $44.99. What's even better is you can get a coupon for $5 off the medium or $8 off the large by clicking HERE and printing off a store coupon. HoneyBaked also offers a variety of Party Trays and Platters filled with their yummy meats (like smoked turkey breast and premium roast beef) and cheeses. Pair it ups with their artisan bread or Hawaiian rolls and don't forget to add red pepper mayo or chipotle mayo to build a delicious sandwich. Of course, you always have standbys from HoneyBaked Hams--a whole ham, turkey or chicken. I love these! Their ham and turkeys are lean and fully cooked. If you haven't tried these, they have an out of this world sweet, crunch glaze like no other. I couldn't resist getting both the ham and the turkey and they are delicious. My husband barely had them in the house when we were already picking at them. I don't know how they get the outside to crust up like they do, but it is delicious! Not only is the meat good for dinner but good for sandwiches, too. What's really nice is it comes sliced thinly--even the bone in ham! Makes it super easy to serve. Heat and eat or enjoy cold! Love that even the bone-in ham is sliced for easy serving! 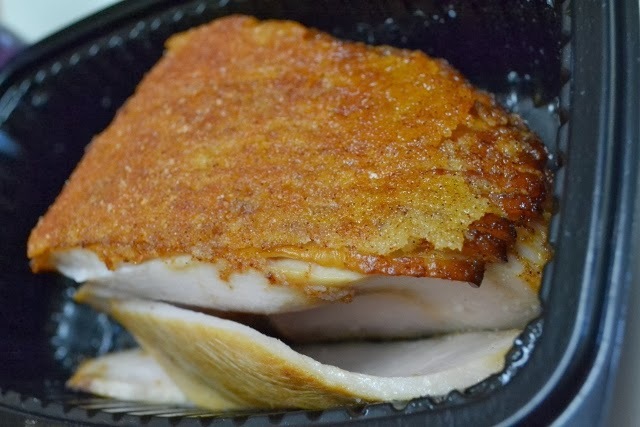 Look at the beautiful crispy glaze on this turkey breast! 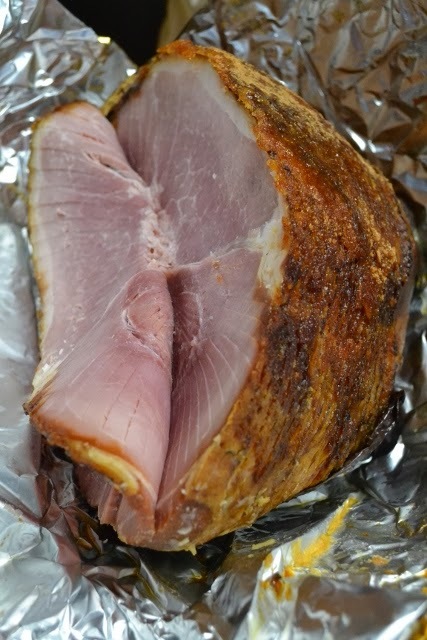 You can get hams as small as a quarter ham to serve 6-10 people or bone-in hams that serve up to 20. (For those of you who love soup, you can even purchase ham bones!) I didn't even know this, but also have BBQ ribs with a variety of sauces as well as pulled pork to make sandwiches. Wouldn't this make an awesome Super Bowl Spread? They also feature plenty of sides such as Potatoes Au Gratin and Pasta Salad and even loaded baked potato soup. 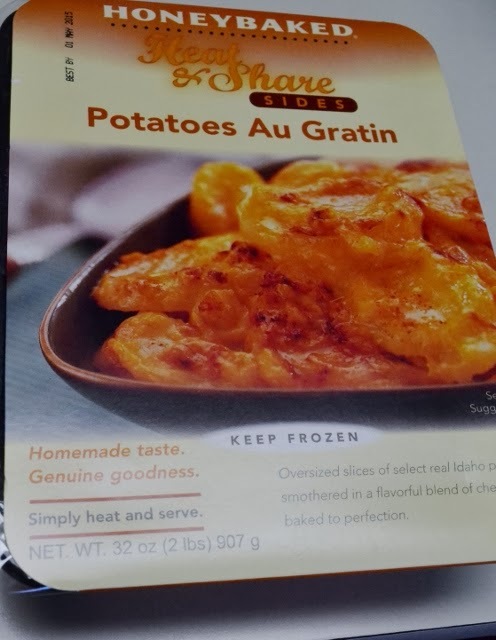 Here is the package of Potatoes Au Gratin. 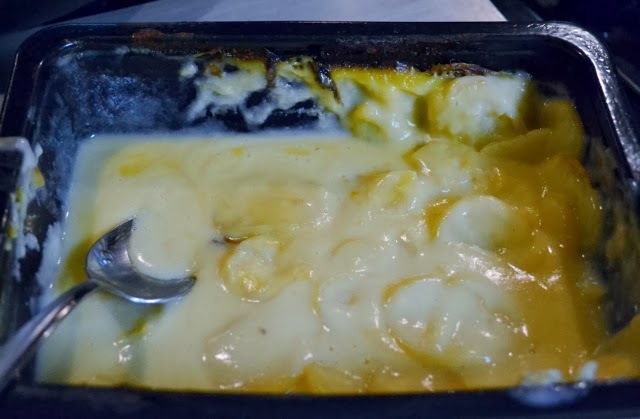 We just heated straight out of the freezer for 30 minutes and they were ready to serve. They tasted like homemade! You can see they went fast! Of course, we can't forget about dessert. They have cookies, cheesecakes and coffee cake. Oh my! The cheesecakes are to die for! I just had to sample a bite of each. 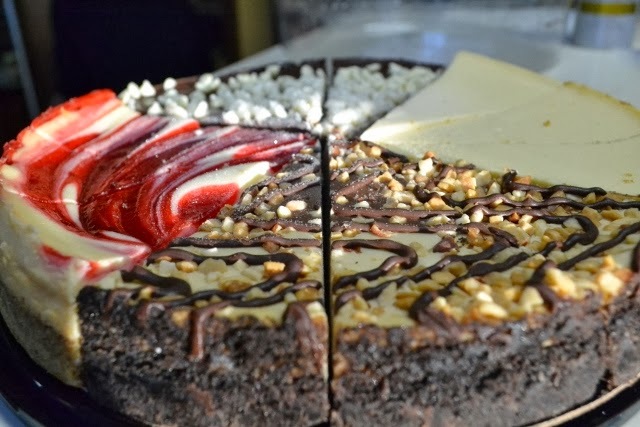 Strawberry Swirl, New York Style, Mud Pie and Triple Chocolate Cheesecake ended a great meal! The one thing that is SUPER IMPORTANT is that you place your catering order 24 hours before you need it. In fact, I would probably call it in even earlier for Super Bowl. Or, you can order online. How would you like $25 to try HoneyBaked for yourself? Just enter the simple easy giveaway below to win a $25 gift card for HoneyBaked. I honestly don't have a preference but I guess I'll pull for the broncos. I don't know who I would root for. I only watch the SuperBowl for the commercials! I'd like to see Denver win, but if Seattle won it wouldn't bother me. I'll be rooting for Denver but it wouldn't bother me if Seattle won. I'd like to try the ham. I have never been there. Our team is not playing so we are rooting for the Broncos. I would really like to try the Honeybaked turkey breast. I will be at a swim meet during the Super Bowl, but I am sure my swimmer would eat a whole super sandwich after he is finished!! Bring on the Super Sandwich!! I'm rooting for the Seahawks!I'm really a Steeler girl at heart. I would like to try the Turkey breast, I have tried the Ham many times and love it. I will be cheering both teams on during the Superbowl this year! I will be cheering for the Broncos. I would like to try Honey Baked Mini Ham. I really dont watch the Super Bowl so no one I guess :) Thanks for the chance to win! I hope the best tem wins! Would love to try the crowd pleaser! we want Denver to win! I don't follow football, but I would root for the broncos because I like horses. Thank you. I am routing for the Broncos and hubby is for the Seahawks! I don't really know a Bronco from a Seahawk, but I will say the Seahawks. We will be cheering for the Broncos this year. I'd like to try one of their VIP Buffets! I will be routing for the Seahawks. I honestly don't have a preference. Still will be fun to watch. We will be rooting for the Broncos! we would love to try the broccoli salad! I am rooting for the Broncos! I would like to get the honey baked ham and try the red velvet cake! I would love to try the red velvet cake. It looks great. Thank you.